Modern Quilting by B: The Halloween Blog Hop is Here!!! The Halloween Blog Hop is Here!!! 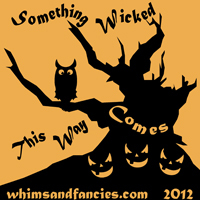 The Whims and Fancies 2012 Halloween Paper Pieced Blog Hop is finally here. The first stop is today at Ruthie quilts! And quilts..., where an adorable hanging bat and some candy corn await. You can access the main blog hop site through this button or visit each of the participants sites through their links listed below. Be sure to stop back here on Tuesday the 9th where my block will be featured.